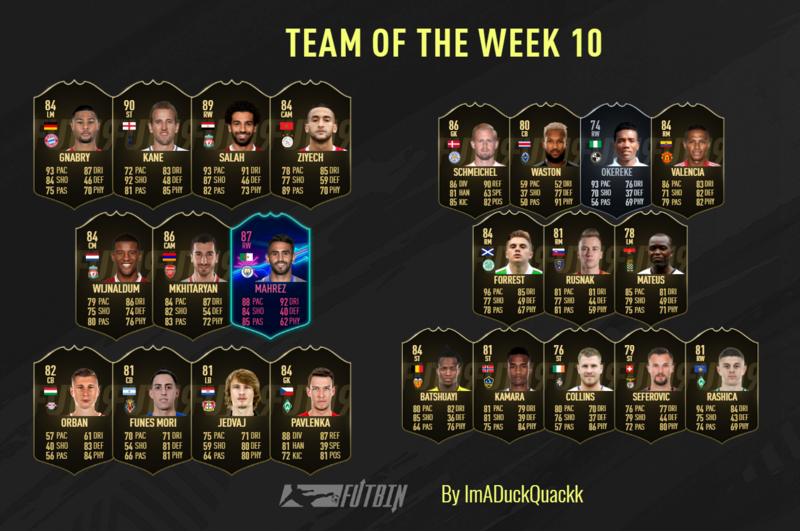 TOTW 10 is the big one. This is the week that EA usually drop a repeatable SBC, and hence they want this to be absolutely stacked. So what happens when this becomes difficult to do? What happens when you are really stretched to make this a killer lineup? Well, we have tried our best to mimic EA’s train of thought, and create the most packed TOTW that is possibly viable! What a strange week for goalkeepers this was. There were several keepers who made one or two fantastic saves, but the issue is that this was all they had to do across the match. EA could literally go in any direction here, with the likes of Alisson, Patricio, Donnarumma or even Olsen in with a shout. We however, decided to go with Pavlenka, who made a couple of great saves to give Czech Republic the win over Slovakia in the week. Usually when the International break rolls around, we have a whole heap of possible defenders that could fill these precious few slots. This week however, options are extremely limited, and it looks like a goal with a clean sheet could easily be more than enough. Argentina were 2-0 winners over Mexico in the week, and with a goal, plus the clean sheet, Funes Mori seems to have ticked every box required to make the cut this week. Now this player took me roughly a zillion years to locate while doing these predictions, not because he was difficult to find, but simply because his NIF this year is German, while he featured for Hungary on the weekend. Hungary brushed aside Estonia in a 2-0 win during their match, and just like Funes Mori, Orban provided both the goal and clean sheet, which allows him to slide straight into these predictions. Next up we have a 5 goal thriller, between two absolutely massive International sides. Croatia played hosts to Spain last week, and in a game of 5 goals, it was the hosts who took the win with a 3-2 victory. Now Jedvaj at the back didn’t quite manage to keep a clean sheet, however with 2 goals to his name it becomes almost impossible for EA to exclude him from the final line-up this week. Holland were surprise 2-0 winners over World Cup winners France in their first game this week, and with such a result it would just feel wrong to not feature one of these players amongst these predictions. Depay took the man of the match of award, however his recent inform excludes him from the shortlist. The other goal went to Wijnaldum in the midfield, the only worry here is the magnitude of Liverpool players who could possibly steal a spot this week. We move onto a fairly controversial pick now, and it’s not because Mkhi doesn’t deserve the spot, its based around his recent UCL card and how the challenge is still currently active. Armenia were comfortable 6-2 winners over Gibraltar on the weekend, and while Movsisyan up top managed to bag himself 4 goals, sadly he doesn’t feature in within FUT and hence we are left to look elsewhere for a nomination. Mkhitaryan was also fantastic on the day, providing 2 assists and running circles around the opposition throughout. Finally! It has to happen this time, we have included this man almost every week within our predictions, but surely this time, he makes the cut! Morocco were 2-0 winners over Cameroon during their first International match this week, and Ziyech was the man behind both of the goals. He may have been robbed during his domestic matches, however this time EA have no other option! Initially I really wanted to include Sule in these predictions, however with 2 Bundesliga defenders already making the cut, Gnabry is the default selection, and a much more exciting FUT card too! Germany brushed aside Russia in a 3-0 home win earlier this week, and with a goal to his name and an incredible performance, Gnabry could be in line for an in-form too. It looks like we could be seeing a SIF for yet another OTW card this week, and once again it comes from a player within the Premier League. Algeria absolutely dominated Togo during their fixture this week, and left the match as 4-1 winners. Mahrez was once again in fine form, scoring twice and giving himself a real chance at yet another upgrade already this year. Now this selection is definitely a very debatable choice, and if we are being honest, he is only making the line-up because it’s TOTW 10 and EA will very likely want an absolutely stacked team. Salah is likely to find himself getting multiple special cards across the season while playing for Liverpool, but his first nomination this year is found from an International fixture. Egypt and Tunisia were neck and neck at 90 minutes, with 2 goals a piece, and if anyone was going to break this deadlock, it had to be Salah. A 90th minute winner usually isn’t quite enough, but as we mentioned before, TOTW 10 holds some magical powers. Our final selection for this starting eleven sees us heading across to England, where an all or nothing match for both Croatia and England was took place. After going down 1-0, England needed to win the match in order to avoid relegation. Kane almost found the back of the net for the first goal, which was touched in by a teammate. The second however was all Kane, as he completed the comeback, picked up the win, and worked his way into our predictions this week. First up we find ourselves heading across to an Icons son, a man who put in one hell of a performance, and ensured that his side ended up topping the group. Denmark were 2-1 winners over Wales in their first fixture this week, and despite conceding a goal, this man was in fine form. In a week where most goalkeepers had very little too do, the 6 saves here shines above the field, and lands him his first nomination of the year. Costa Rica had a difficult fixture away to Chile this week, however despite the odds, they managed to edge the match 3-2 in the end. Waston played a monumental part in this victory, scoring just as many goals as he conceded, ensuring he made up for any potential slip ups that took place across the defensive line! Angolo were hosts to Burkina Faso this week, and in a match that provided fans with 3 goals, it was the hosts who took the win with a 2-1 victory. Mateus was definitely the hero on the day, scoring both of the goals, and securing his man of the match award too. Now this man may not be having the best of seasons with United, however when these players leave for International duties, everything changes. Ecuador were 2-0 winners away to Peru this week, and with Valencia playing in a more attacking position on the wing, he once again showed just what he is capable of when going forward. With a goal to his name and a fantastic performance throughout, we could be seeing this man his both an upgrade and a position change this week! Kosovo were away to Malta for their first match this week, and after an incredible 5-0 victory, it looks like the journey was definitely worthwhile! Rashica was the man of the hour, scoring once and assisting a further 2 throughout the match, which is very likely enough to secure him an inform this week. It looks like we could be seeing yet another SIF feature within these predictions, and if it isn’t Forrest, it could very well be Fraser! Scotland were 4-0 winners over Albania on the weekend, and once again Forrest simply couldn’t stop scoring! With another 2 goals to his name and a man of the match performance, he sneaks his way into our line-up once again. Slovakia and Ukraine is our next match, where we find a game that provided fans with 5 goals. Sadly for the visitors, it was the hosts Slovakia who took 4 of these, and took the points in a 4-1 win. Rusnak was incredible throughout, scoring once and assisting another two. We briefly head away from International matches now, for a couple of top tier performances from the lower divisions across the world. First up we head over to Italy’s second division, where Spezia were 3-1 winners over Benevento. Okereke was a man in form, scoring twice and terrorising the opposition from start to finish. He could be the only NIF bronze to make the line-up this week! Next up we head across to England, where we find a dominating performance from the 3rd tier of English football. Luton were comfortable 5-1 winners over Plymouth in their League 1 game, and with not one, not two, but three goals, Collins secured his hat-trick alongside his place within these predictions. From one hat-trick to another now, as we head across to one of the more remarkable wins of the week. Switzerland absolutely battered Belgium 5-2 in their first fixture, and despite Shaqiri's 2 assists, it won’t be another Liverpool player we are talking about here! Seferovic was the man who led the attacking line, and with 3 goals to his name, you couldn’t have asked for a stronger striker on the day. We made a decision to not release predictions until Mondays games were done, simply because we felt EA would want this TOTW to be packed. Sadly, the only addition we found was from the Cyprus vs Norway match, where Kamara was a man on fire. Norway left as 2-0 winners, and although the MLS season is over, Kamara showed that he is far from done playing football this year. Our final selection is one that brings me great pleasure to include. An icon, a hero, a god amongst men, it is the man himself, Batsman. Belgium breezed past Iceland in their first match this week, with a 2-0 win at home, and just like the last 2 games, it was the superstar striker who scored both the goals!